NASHVILLE — It didn't take long for former Tennessee Republican Party Chairman Ryan Haynes to land a new gig. Three days after Haynes departed his job as GOP chief, the one-time state representative from Knoxville went to work for the Wine & Spirits Wholesalers of Tennessee. Tennessee Ethics Commission filings show Haynes, 31, signed up to lobby for the Wine & Spirits Wholesalers of Tennessee on Dec. 6, about 72 hours after the GOP's state Executive Committee members voted this month to replace Haynes, who did not seek re-election as state party chairman. Haynes declined to discuss his new job with a Times Free Press reporter. Once seen as an able lawmaker with a future in House leadership, Haynes has now cast his lot with the wine and liquor wholesale distributors organization as the group finds itself increasingly on the defensive. GOP majority lawmakers are far more free-market oriented toward the industry than Democrats were when they held sway over the Capitol. Wholesalers' hiring of Haynes is being described as a "huge change," with the former lawmaker now becoming the heir apparent to the wholesalers' legendary lobbyist, Tom "the Golden Goose" Hensley. Hensley, who first began lobbying in the 1960s, earned the nickname decades ago for his free-spending ways during a less-regulated era at the state Capitol when lobbyists could — and did — wine and dine lawmakers with far fewer restrictions. Hensley didn't return a phone message seeking comment. But Senate Republican Caucus Chairman Bill Ketron of Murfreesboro confirmed there is a slow-motion shift of sorts underway in the wholesalers' organization which for decades has shaped how, when and by whom wine and liquor get sold in Tennessee. In 2014, Ketron outmaneuvered Hensley and the wholesalers, passing a landmark bill marking the first significant change in state law for decades over their opposition. It allowed grocery and convenience stores to sell wine for the first time. Still, before the law passed, Hensley managed to stick a few quills into the law, including delaying the change until last July 1. Asked whether Haynes' hiring by the wholesalers was over Hensley's objections, Ketron said, "it's a succession thing based on what Tom told me. Tom said he's going to try to move into semi-retirement. He's going to work with Ryan during this session. Then there's some kind of wholesalers distributors' school right after session" for Haynes. Ketron said Hensley also told him Haynes would have the opportunity to work with him further and then "at some point in time I'll turn the reins completely over to him. That's all I know at this point." Henry Hildebrand, general counsel for the Wine & Spirits Wholesalers group, confirmed Haynes was working not just as a contract lobbyist for the session but for the organization itself under a decision made by the group's leaders. He referred additional questions to Hensley and a distributor on the group's board, who also did not return calls. Liquor wholesalers' decision to hire Haynes comes as the group gears up for renewed battles over alcohol in the Republican-dominated 110th General Assembly that begins on Jan. 10. But the group these days is not quite the nearly invincible force it once was. When Democrats ran the legislature, wholesalers and their frequent allies, liquor package store owners, worked with anti-alcohol lawmakers to help shape many of the restrictions in Tennessee today. After losing on the wine-in-grocery-stores front, at least one other legislative battle involving alcohol already appears to be brewing in the 110th General Assembly. Grocery store chains and convenience store owners want to jettison a provision in the 2014 law beneficial to wine and spirits wholesalers that prohibits wholesalers from stocking wine products on grocery store shelves. Haynes, an attorney, was first elected to the House in 2006, four years before Republicans seized complete control of the entire General Assembly. He later served as chairman of the State Government Committee, where alcohol bills are first considered. 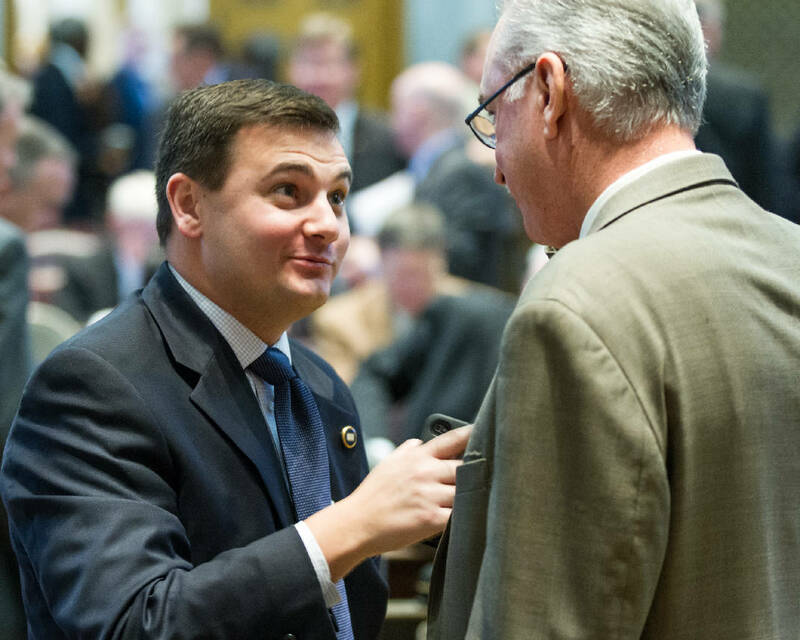 House Majority Leader Glen Casada, R-Franklin, described Haynes as "smart," with a number of long-standing friendships among lawmakers. Casada said he believes Haynes will represent his new bosses well, although he stopped short of predicting how successful Haynes will be. Because Haynes has been out of the legislature for 18 months, the one-year ban on former lawmakers lobbying their one-time colleagues has come and gone. Meanwhile, if Hensley is "the Golden Goose," what is Haynes going to be called? Some old Capitol Hill hands are arguing for "the Gosling." But Ketron said Hensley told him it will be "the Duck."